PODERE IL PINO... THE RIGHT PLACE FOR THE RIGHT HOLIDAY!!!! Podere il Pino is the perfect place for a relax vacancy in the green Tuscany country, surrounded by vineyards and olive groves in the gentle Chianti hills. From its privileged position it offers a spectacular view of the marvellous medieval village of San Gimignano (very famous for the 7 medieval towers and museums) and the whole Val d´Elsa. This enchanting place far away from every noise is the ideal place in which to regenerate the body and the mind, where it is possible to go on walking or mountain bike excursions (we rent bike). We organise excursions, cooking and ceramic class, wine testing, walking in the country, horseback riding, tour in the best cities and museums and we have a convention with the best Tuscany restaurants. It is situated just 3km from Colle di Val d´Elsa (glass town), 5km from San Gimignano and near to artistic cities such as Florence, Siena, Pisa, Monteriggioni and Volterra and is just an hour from the sea. 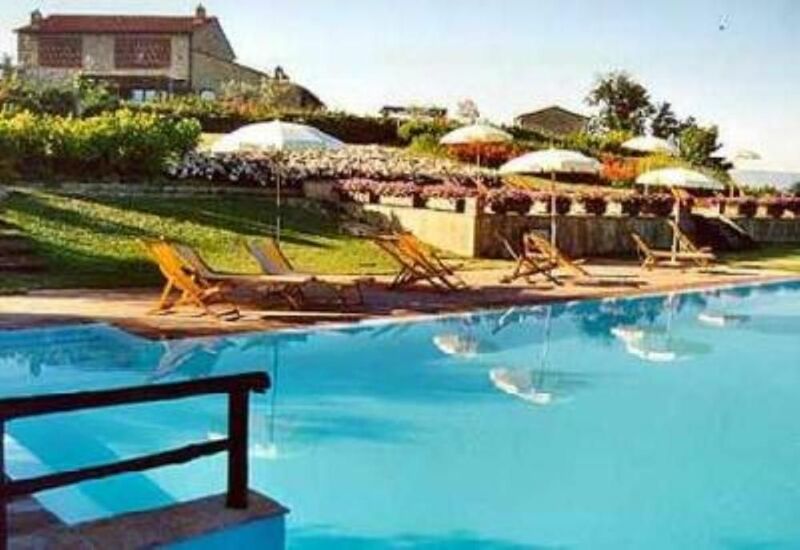 Due to its tranquil position, it is the ideal place to regenerate the body and mind in the beautiful Tuscany country. DON'T HESITATE TO CONTACT US !!!!!!!!!! "Logement non conforme à la description: 1 chambre au lieu de 2 et 1 salle de douche au lieu de 2 ! Dormir dans la même chambre que nos 2 grands ados... ce n''était pas des vacances, nous avons donc déménagé les lits dans le séjour. A la réservation, j''ai bien demandé si 2 chambres et 2 douches: réponse affirmative. De +, les photos montrent aussi 2 chambres et et 2 SDE (d''un autre logement)!!! Sinon, piscine et paysage superbes, bien situé. Tarif excessif. "E' stata una vacanza fantastica in un posto altrettanto fantastico!" "El sitio es maravilloso por sus vistas, sus jardines, y su piscina. El desayunar y cenar en el jardín al lado de la cocina, no tiene precio." From the A1 autostrada take the “Firenze Certosa” exit. After the pay toll, turn right for Siena. Continue along the “Superstrada” for around 30 Km. until the "Poggibonsi Nord" exit (the fifth exit). At the roundabout follow for San Gimignano. Continue along the main road until the second roundabout beside the Pam supermarket which you can see on your left. At the roundabout turn right for San Gimignano. Continue straight on for the next 3 roundabouts you come to, following the signposts for San Gimignano. At the fourth roundabout, turn left towards Terenzano. The road turns into a dirt track and starts climbing. Continue straight on following the signposts for Podere il Pino and after 2.4 Km you reach the farm.